As sweet as cinnamon: Legacy, Snugglepot and Cuddlepie! Don't you just love that fabric.... it is 'Legacy' by Moda and I am in love with it..... It is so fresh and crisp........ a darling to work with! 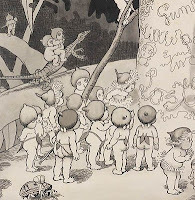 The drawings are so amazing. I love them. 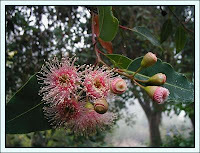 It's Spring time here and all the blossom's are coming out to show their beauty, a beauty that you can not get anywhere else in the world....... Australian Gum tree blossom in pink.......... that will become a GumNut! Now speaking of spring and all things Australian........ Little blossoms and gumnuts...... Watch this space......... for something very exciting and special! I'm glad to hear your dad is doing well! We had a friend who's aorta burst and he was one of the unlucky ones who never made it to the hospital. He was only 46. So hug your dad and enjoy the extra time with him. i was about to say.....Snugglepot and Cuddlepie ....Aussie gumnuts.....that sounds like a stitching project just waiting to happen!!!! Thank God your Father is well....prayers have been flying!!!! Good to hear your dad is better! Gumnuts?...hummmm...interesting! Your stitchery looks amazing! That is fabulous news about your dad ! How generous this is! I'd love to win! !